We always wanted to have a grill on a Sunday with our family in the back yard of our house, but we live in the apartment and actually own neither back yard nor grill. Well, thanks to the technological development that happened in the past several decades, scientists came up with a way to, in a way, simulate the outdoors grill inside the apartment with this piece of kitchen appliance called grill pan. You can probably conclude, by the name of it, that it is actually just a regular pan which can work as a grill due to its features that allow it do so. It is made from cast iron and it has bumps which resemble real grill. However, the question for this article is how to use cast iron grill pan? The first thing is to choose the most suitable one for you? Sometimes, grill pans are so big that they can cover two burners at the same time and they are mostly meant for parties of families that have five or more members. Then, there is the smaller one which is about 30 centimeters wide and which is adequate for the family of up to four members. The next division is also one you should pay attention to – whether your grill pan is made of cast iron. There is also another version of it made with something called nonstick surface. The main difference between the two is that the first one makes better food but requires a lot of cleaning afterwards while the other one does exactly the opposite. 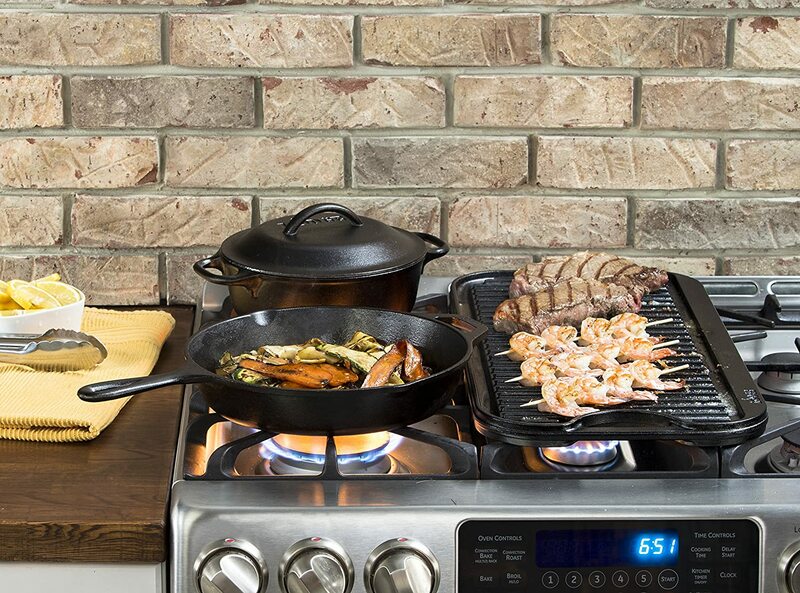 However, we are going to focus mainly on cast iron grill pan due to the fact that it is the taste of the food that we are after and not the process of cleaning. Speaking of cleaning, there is an important part that everyone must do before even thinking of using grill pan for preparing food and that is to remove protection from the pan. Namely, all of the pans are bought with some sort of protective clothing which is pretty invisible and needs to be taken off with a sponge an a little bit of water. Once you have done this, you are ready to go. There is one more thing that you should do before actually putting the food on it – seasoning. Take whichever oil you like and gently rub it on the surface of the pan. This way, you will avoid your food being stuck to the pan and all the possible rust that may appear after several uses. Furthermore, oils will certainly add to the taste itself of the food that you cook which is the most important thing here. Now we come to the actual grilling. Put the type of food that you would usually put in a grill and sprinkle it with a bit more of oil. Put the burners to the maximum since the medium or low setting will not actually grill the food any good and the food may stick to the pan. Just as every grill, this one also generates a lot of smoke during the sole process of cooking and you need to either turn on the fume hood or open the window. If you can do both, that would be the best option. Cleaning after the cooking is also the important part and there is only one important thing to mention – do not use soap. There is a big possibility that soap will destroy all the seasoning that you had done previously and that it won’t actually help you clean the cast iron. Instead, use kosher salt if the food won’t come off by only using water and scouring pad. Finally, before actually storing it, make sure that it is not wet since that may cause it to rust and put just a wee bit on vegetable oil once again on a piece of paper which you will spread afterwards to the whole surface of the pan. To sum up, the question of how to use cast iron grill pan is, hopefully, answered and there are only two main things that you should actually pay a lot of attention to – to have tasty food and to try to rusting of the pan.